Feel free to write your own of the (or related) memes! The chip from its datasheet appears to have decent specifications, and the layout doesn't look that bad? 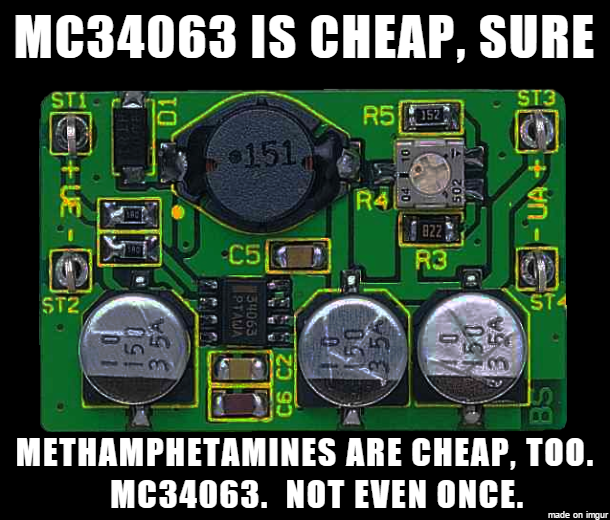 Well apart from 35V caps used on a 40V max chip. Decent in 1980, perhaps! It's dreadfully slow, barely ultrasonic; the control scheme is undefined (you have an "oscillator" block with apparently some means of current sense), the behavior is hysteretic so not only is the ripple massive from the low operating frequency, but it's several times worse due to pulse skipping and chaotic limit cycles; shall I continue? All of the alternatives listed are modern CMOS devices, with operating frequencies up to a few MHz, and excellent stability, efficiency, and current limit performance. You will literally save more on capacitors and inductor alone than the chip cost. Is that the stupid chip with the error amp gain inversion when the common mode voltage range was exceeded. (i.e. negative feedback turned into positive feedback.) I got burned by that figuratively and the parts literally. Die! mofo Die! Dunno, but that's characteristic of many older chips! 1 billion ultra cheap and nasty mobile cellphone chargers use it though. I have repurposed a few as cheap and nasty buck converters to charge batteries, or as simple LED drivers for a single LED. Put a decent cap and inductor on them and they do work well enough.